I'll share with you how I found cheap home furniture for every room of my home! Thrift Stores! I fell in love immediately. Thrift stores are a must for cheap living. Every Saturday became a hunt for cheap home furniture at local thrift stores. My addiction to second hand stores got so bad that I would sneak out to them on my lunch hour to shop! You can save money when you find beautiful cheap furniture in a thrift store... but you have to look and visit often! Here are some of my finds room by room and tips on how I tied all this cheap furniture together to furnish my whole house. I purchased a bed from the 1920's that had smiley face stickers (from the 70's) all over it for $25. I scraped off the stickers, sanded it, repaired some boards, and painted it white. People always want to know if I bought the bed from Pottery Barn. I bought a dresser from another thrift store for $25. It was really ugly with these door knocker handles. I sanded, painted, and replaced the handles. I used a night stand that I grew up with and also sanded and painted it to match the other pieces. I found a desk under a pile of junk in the back of an antique store. The desk started out an ugly pea green and is now a beautiful distressed white. 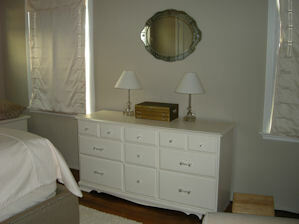 All total including paint, materials, and a new mattress, I furnished this room for under a frugal $500. With the cost of bedroom furniture being too prohibitive, you can get the next best thing. I attacked this dilemma by taking my old dresser and hope chest and had them sanded and painted. I added glass knobs and they look fabulous. I bought a drum table for a night stand from a local second hand store along with an armoire from the Salvation Army that I restored last summer and it all looks wonderful. I saved so much on this cheap furniture, that I did splurge and buy myself a new bed last year. No matter how hard you try, kids tear things up. Never buy kid's furniture new except for safety reasons, you will want to buy a baby's crib, bunk beds, and mattresses new. Changing tables. I wish I had known about these cheap home furniture tips before I purchased a changing table! Use a dresser for a changing table. Just make sure to securely strap the changing pad to the table so the baby can't roll off. A potting bench? Yes, I have a friend that stripped and painted a potting bench to make it into a changing table, and you know it actually looks great and holds everything. One of those center island kitchen carts with locking wheels. These are great for storage and you can wheel them around. Again, just make sure to securely strap the changing pad to the table and lock the wheels when you use it. For my toddler, I found a wood twin bed and night stand for $30 which I sanded and painted. For a dresser, I bought him a red rolling toolbox that I found at Lowe's for $99! Your options are as limited as your imagination! Just remember safety first when it comes to furniture for little ones. My kitchen dinette set was bought from a discount furniture dealer (one of those on the bad side of town). It's solid oak, has lasted for 10 yrs now, and looks great at only $200 for a table and six chairs. My formal dinning room table was purchased from a local thrift store for $100. 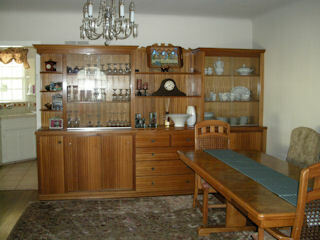 It has a beautiful wood inlay with caned backed chairs. One of the chairs was ripped and I was going to have it repaired, but decided to make custom fitted slip covers and they look great! Total cost for the table and chairs including fabric for the slip covers was $125. I found the fabric in the discount bin at a local fabric store. For my living room I wanted a nice fluffy Pottery Barn type stuffed couch, but without the Pottery Barn price. I happened across a furniture consignment that had one the perfect couch for $400! Not bad for a down filled, chenille covered couch. I found my coffee table and slipper chairs at the local Salvation Army store. I ended up paying $325 for a coffee table and two slipper chairs. I was on a high for a week over these finds. Now you may be thinking all this cheap home furniture is secondhand and looks shabby, but that's just not the case. I found a great upholstery guy who has given me substantial discounts over the years because I have given him a lot of business, both from my furniture and referrals from friends and I ask for a discount! I further cut the cost of reupholstering furniture by buying my own fabric and save a ton of money! I only buy fabric at my local discount fabric store. For window coverings, I'm lucky as my mom is a fabulous seamstress and has done everything from simple window panels to Roman shades. If you don't know someone who sews, it's easy and you can sew up a couple of drapery panels and pillows to spruce up your home in an afternoon. Just remember to buy your fabric from a discount retailer. When shopping at thrift stores remember to go often as the inventory changes. Find a good upholstery person, use your own fabric, and ask for a discount! Get creative, become a frugal penny pincher and buy yourself some cheap home furniture. You can have fun with this and your results will be a beautiful home bursting with the life you give it.